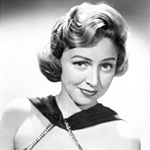 Anita O'Day : Big band vocal charts from Anita O'Day. A selection of Anita O'Day vocal arrangements for solo vocalist with big band. Born Anita Belle Colton in Kansas City, she left home at the age of 14 to be a dancer in the popular "Walk-a-thons" and other endurance dance contests. Her first break came in 1938 when she secured a gig with the Max Miller quartet. Gene Krupa hired her in 1941 and, following the break up of Krupa's band, came quick stints with Woody Herman and Stan Kenton. Throughout her career she tried to achieve popular success without compromising her identity as a jazz singer. Which songs was she best known for? Her first big hits were with Gene Krupa -"Let Me Off Uptown" - a duet with Roy Eldridge, followed by others such as "Massachusetts" and "Stop! The Red Light's On", then "And Her Tears Flowed Like Wine" with Stan Kenton and "Ten Cents a Dance" with Billy May.